Wonder Woman 1984 has wrapped principal photography. 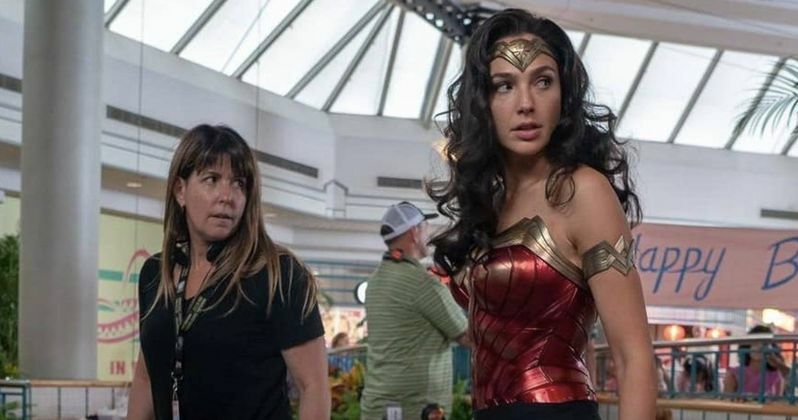 Gal Gadot shared pictures from the set and a nice message to the cast and crew, the fans, and director Patty Jenkins. Filming on the sequel began in June of this year in Virginia. They were shooting a lot of outdoor scenes, so Jenkins and Gadot beat the leakers and provided official images from the set before anybody, which was refreshing. Some of the first footage was shown off a month later at San Diego Comic-Con by Jenkins and Gadot, featuring Wonder Woman fighting off thugs in a mall. 6 months after production officially started, Wonder Woman 1984 is done in time for the holidays. There will more than likely be some reshoots, but for now, the cast and crew can sit back and relax. To celebrate the occasion, Gal Gadot released a message that started by thanking the crew that worked long hours to bring the world of Wonder Woman to life again. She had this to say. "We did it. Again!! And as much as the first time shooting Wonder Woman was amazing, this time was even more unique and special.. We shot in 4 very different locations in 3 countries, and I'm so soooo proud of the almost 1000 crew members who came to set every day, giving everything they have into our movie." Gal Gadot went on to discuss working with Patty Jenkins for a second time. The actress and director hit it off immediately while filming Wonder Woman last year and became fast friends. The two were able to bring a very successful version of the character to the big screen that stripped her away from her Justice League pals and let her stand on her own. Audiences loved the movie and the DCEU had their first hit. Gadot's message finishes by thanking Jenkins and sends praise to the fans, which you can read below. "Couldn't ask for better partners on this... I'm so lucky to have the one and only Patty Jenkins, as my director. She always has our backs, she gives us the wings to dare, and every day she helped us find the most creative version of ourselves... I am so grateful to call her my friend. And to our amazingly talented cast who made every day enjoyable and fun, thank you! Honestly... Words cannot describe this experience... This journey was so demanding and challenging but we all came and did our very best every take, every day, putting our all out there and I'm so proud... Thank you universe for this opportunity. I love this character. And thank you to all of you for being the best fans in the world. It was you that made me push myself every day. I'm so happy and excited, can't wait to share it with you in 2020!" Wonder Woman 1984 was originally set to hit theaters in December of 2019, but was later moved up to November, and then finally given the June 2020 official release date. The summer release date seems like a better fit for the movie and gives a lot more time to be taken during the post-production process to make sure everything runs smoothly. Fans who were excited about the original release date only have to wait 6 months longer to see the sequel on the big screen. The DCEU is currently riding high off of the success of Aquaman, which dominated this past weekend's box office after earning over $200 million in China. After that healthy head start, the movie is expected to bring in some extra cash during the holidays. Gal Gadot will be back for Wonder Woman 1984 in 2020, hoping to replicate or even top the success of the first installment. You can read the heartfelt message and production wrap announcement below, thanks to Gal Gadot's Instagram account.